Male mallard taking off from the water. Mallard ducks weigh two to three pounds, are 15 to 16 inches in length and have wingspans of 32 to 37 inches. Mallards display sexual dimorphism (males and females look different). 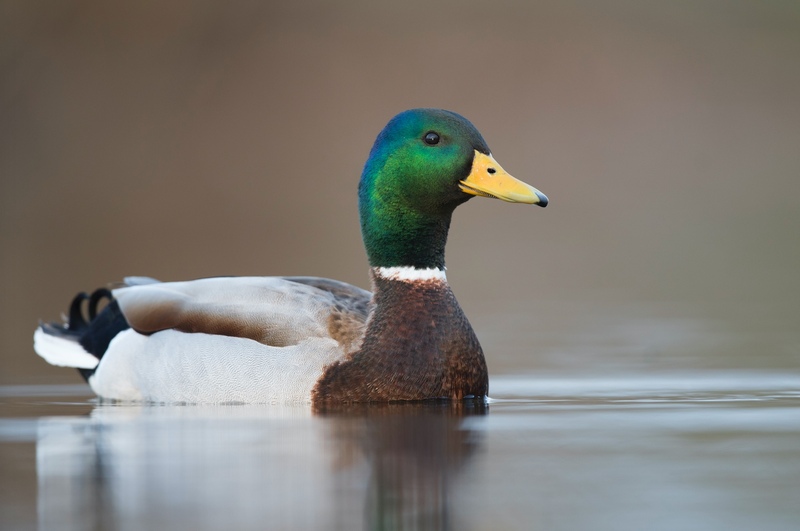 During the breeding season, male mallards (drakes) have an iridescent green head, yellow bill, white band around the neck, rusty colored chest, gray body and blue speculum (wing band) on the wings. 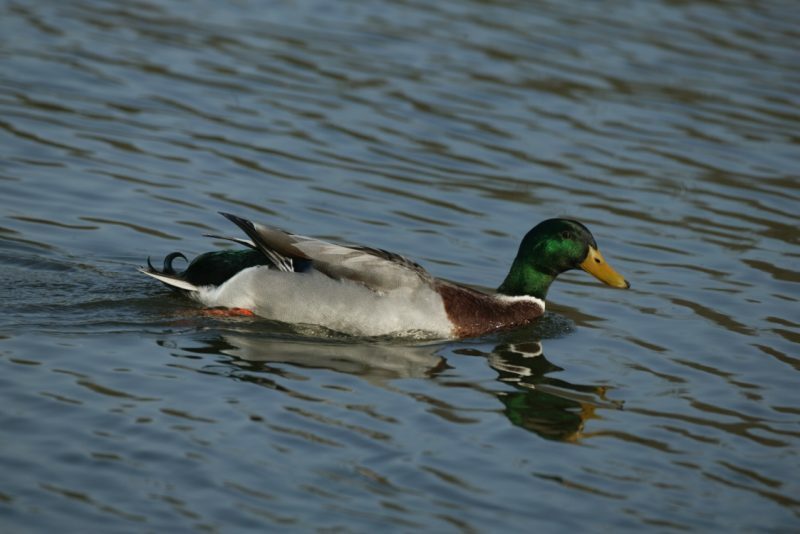 From mid-summer and throughout the fall, drakes resemble female mallards (hens) but retain a dark green crown. Hens are mottled brown and tan with a dark brown cap and brown eye stripes. Domesticated Mallards and domesticated ducks (such as Pekin Ducks) may breed (hybridize) when in a pond, lake or park setting. Many of these hybrids will look like Mallards but have white patches somewhere on their body. A male mallard in breeding plumage. Check out the Cornell Lab of Ornithology All About Birds website about the mallard for audio clips, ID info and life history. Mallard ducks are the most widespread and abundant duck in North America. In Illinois, mallards are an abundant migrant and winter resident. They are also a common summer resident. Mallards breed in every county in Illinois but are more common in the northern two-thirds of the state. Mallards are dabbling ducks. They filter-feed at the surface of the water and tip-up in shallow water to feed on submerged vegetation. Mallards molt their feathers in late summer. During this time, they are unable to fly until the flight feathers are replaced. Mallard ducks are important seed dispersers and food resources for predators. Mallard ducks are not considered to be a public health concern, as they are not significant carriers of infectious diseases transmittable to humans or domestic animals. However, direct contact with ducks or droppings should be avoided. High temperatures and low water levels during the summer months can result in a botulism outbreak among mallards in urban ponds and lakes. Ducks accidentally ingest the toxin produced by a bacteria (Clostrium botulitum). Botulism causes the ducks to lose muscular coordination and can cause major die-offs. Mallard ducks use wetlands or open water areas such as lakes and ponds. They are common residents in suburban areas, especially near stormwater management ponds and other sources of water, such as swimming pools or koi ponds. Young mallard ducks have the same coloring as hens. The drab brown plumage helps protect the ducks from predators. Mallards are generalist feeders. They are known to eat insect larvae, aquatic invertebrates, earthworms, acorns, the seeds of wild millet, marsh smartweed, bulrushes, sedges, pondweeds, corn, wheat, soybeans, barley and oats. Mallards form new pair bonds each fall, with courtship lasting throughout the winter months. Nesting in Illinois occurs April through July. The peak of nesting occurs in mid- to late-May. Nests are built on the ground using locally available plant material and the hen’s breast feathers. In urban areas, mallards have been known to build nests in very unusual places, such as rooftops, parking lots, near swimming pools, in window wells and in flowerpots. Hens lay six to 14 creamy to greenish-buff colored eggs. Incubation is done by the hen and lasts 23 to 29 days. 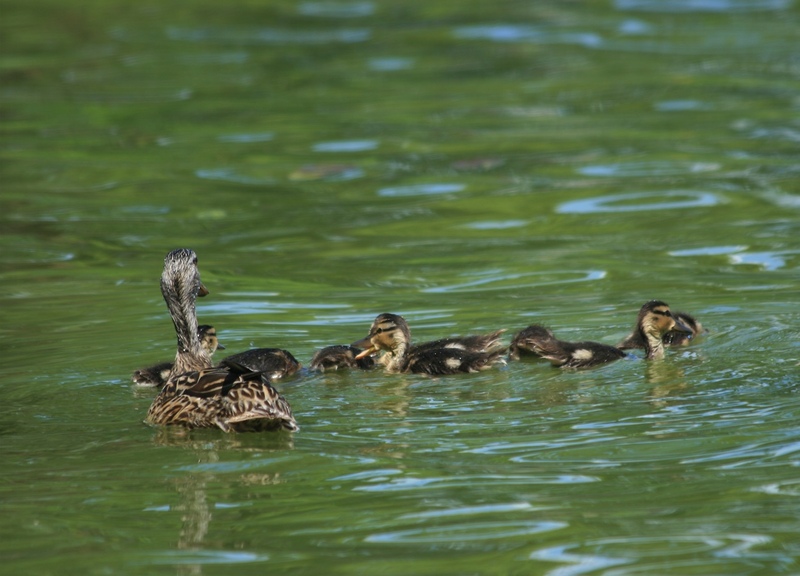 Mallard ducklings are led to water by the hen within 24 hours of hatching. Mallards stay with their young. If you find mallard ducklings without adults nearby or ducklings in a trapped condition, call a wildlife rehabilitator for assistance. Do not remove the ducklings from the area yourself. If present, the adult female should be captured first and placed in a container with the young. The adult and young should be brought immediately to appropriate habitat nearby and released. Young mallards are independent at 52 to 70 days. A female mallard with her young. Mallards typically live one to three years. More than 50 percent of mallard ducks will not survive their first year, falling prey to predators such as American crows, mink, foxes, coyotes, raccoons, skunks and snapping turtles. Mallards are the most commonly harvested duck in North America. Mallard ducks are not likely to do much damage when there are only a handful of birds. However, large flocks can lead to problems. In urban areas, mallards can contaminate lawns, patios, decks and swimming pools with droppings. Mallards that have successfully raised young in an area are likely to return to that area the following year. Additionally, the presence of ducks on a body of water attracts more ducks to the area. When it comes to dealing with mallards, preventing them from using an area is much easier than discouraging them from using a site once they are established. Do not feed ducks or geese. Artificial feeding attracts more birds than would naturally be found at a site. Discourage ducks from feeding on waste seed under bird feeders. A short fence about two to three feet high or thick shrubbery around an area such as a swimming pool or deck can help to deter ducks from walking into those areas. Ducks can be discouraged from using a swimming pool by covering the surface area of the pool, when not in use, with a pool cover or with floatable objects such as pool toys, rafts or balls. Use as many floatable objects as you can to cover the surface. 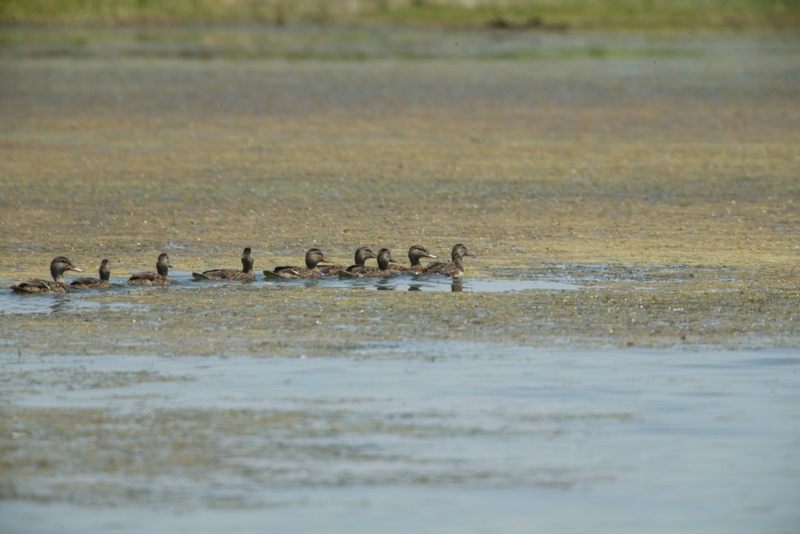 There are currently no registered repellents for use in deterring ducks in Illinois. Ducks are naturally wary of people. Approaching ducks when they are out of water may make them relocate. However, this technique will be ineffective if the ducks have become accustomed to being fed by people. The use of trained dogs to harass waterfowl has proven to be an effective way to keep waterfowl from using a site. However, the dogs are not allowed to make contact with or injure the ducks. Ducks can also be scared away by chasing them, making loud noises, and by sprinklers set up on a motion-detector. In Illinois, mallard ducks, like all waterfowl, are protected by the federal Migratory Bird Treaty Act and the Illinois Wildlife Code. It is illegal to kill or remove ducks or to destroy their nests or eggs. If you need assistance with an urban mallard duck issue contact the Illinois Department of Natural Resources Urban Waterfowl Program Manager at (847) 608-3167 or the U.S. Department of Agriculture’s Wildlife Services Program in Illinois at (217) 241-6700 or toll free at 1-866-4USDAWS. In Illinois, mallard ducks are federally protected by the Migratory Bird Treaty Act. They are also protected by the Illinois Wildlife Code. Federal and State permits are required to remove mallards and/or their nests and eggs. If you need assistance with an urban mallard duck issue contact the Illinois Department of Natural Resources Urban Waterfowl Program Manager at (847) 608-3167 or the U.S. Department of Agriculture’s Wildlife Services Program in Illinois at (217) 241-6700 or toll free at 1-866-4USDAWS. 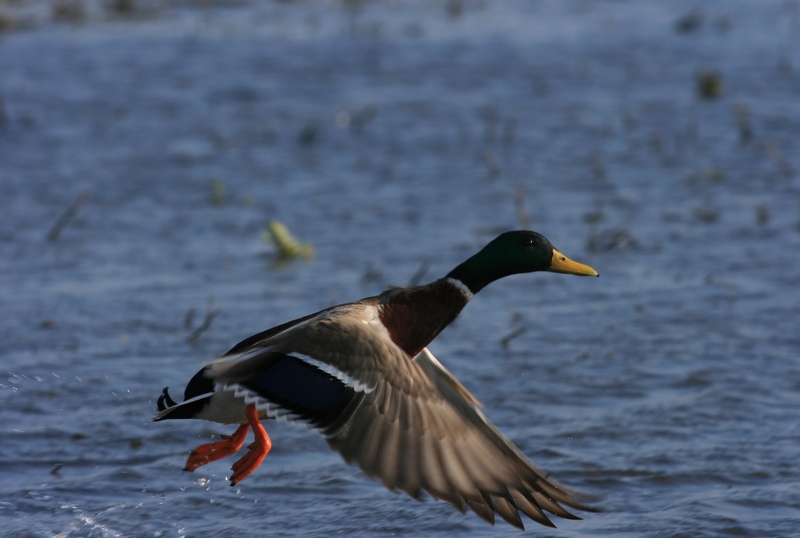 In order to hunt mallards and other ducks, an Illinois hunting license, Illinois waterfowl stamp, Federal waterfowl stamp, and registration with the Harvest Information Program are required. Click HERE for more information about licenses and current waterfowl hunting regulations in Illinois.